You can get the job done even when you're not allowed to use plug-ins (quite common in government agencies). You can do things that are not possible in plug-ins (like utilize modal pages and IRs). You're not limited to the features of the plug-in and can customize things as much as the requirements dictate. Finally, and perhaps most importantly, you may learn something new that helps you use APEX more effectively going forward. If you don't already have an APEX 5 workspace, or if you'd rather use a new one just for testing, head to http://apex.oracle.com to request a free workspace. Also, I'll be using the DEMO_CUSTOMERS table for this demo. If you don't have that table, install the Sample Database Application from the packaged apps. Let's get started! Leave the default application type of Desktop and click Next >. Set Name to Native Super LOV Demo. Click Create Application to skip through the rest of the wizard. Click Create Application one last time on the confirmation page. That should create the application and redirect you to the application home page. Next up, we'll add a new region to the home page with two items. One item will be used for the display value (text field) and the other for the return value (hidden). Click Home in the pages report to go to the Page Designer for that page. 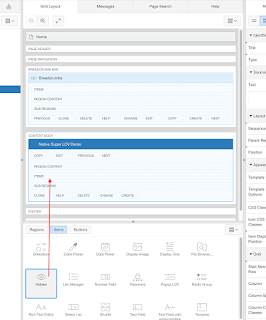 Drag and drop a Static Content region into the Content Body display point. In the properties panel on the right, set Title to Native Super LOV Demo. Drag and drop a Hidden item into the Items section new region. In the component panel on the left, click the new P1_NEW item to select it. In the properties panel, set Name to P1_CUSTOMER_ID. Set Value Protected to No. Drag and drop a Text Field item into the same region as before. Set Custom Attributes to the code below. The readonly attribute will keep users from working with the text field directly (they'll use the modal LOV) and the data-lov-search-js attribute is there so that the APEX engine will give us a proper link to the modal page when it's created. Set Post Text to the code below. This will add the "clear" and "open LOV" buttons to the right of the text field. In the component panel on the left, click Page 1: Home (top node in the tree) to access the page properties. 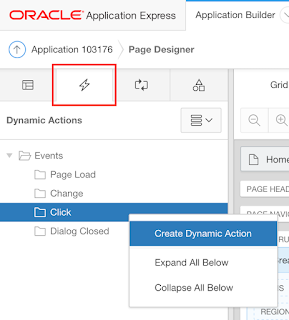 In the properties panel, set Execute when Page Loads to the code below. I've added some comments to explain what's going on. // same as the display item but end with "_ID" instead. // the change event in case anyone is listening for it. That wasn't so bad was it? Don't try testing things just yet. You'll need to wait till after the next part for that. On the Page and Region Attributes step, make sure Page Number is set to 2. Set Page Name to Select Customer. Set Page Mode to Modal Dialog. Click Next > to skip the Navigation Menu settings. On the Report Source step, make sure Page Number is set to 2. Set Table / View Name to DEMO_CUSTOMERS (table). Set Link to Single Row View to DEMO_CUSTOMERS (table). At this point you can run page 1 to test. Click the "open LOV" button and you should see the interactive report page open as a modal dialog. Things are coming along nicely! Now we need to start configuring the modal page so that it functions like an LOV. We'll add some CSS so that hovering over the rows makes the cursor a pointer. Then we'll add some items that correspond to the 2 items on the first page for proxying purposes (relevant in the next 2 steps). Finally, we'll make some changes to the report so that it better meets our needs. Navigate to the Page Designer for page 2 and complete the following steps. 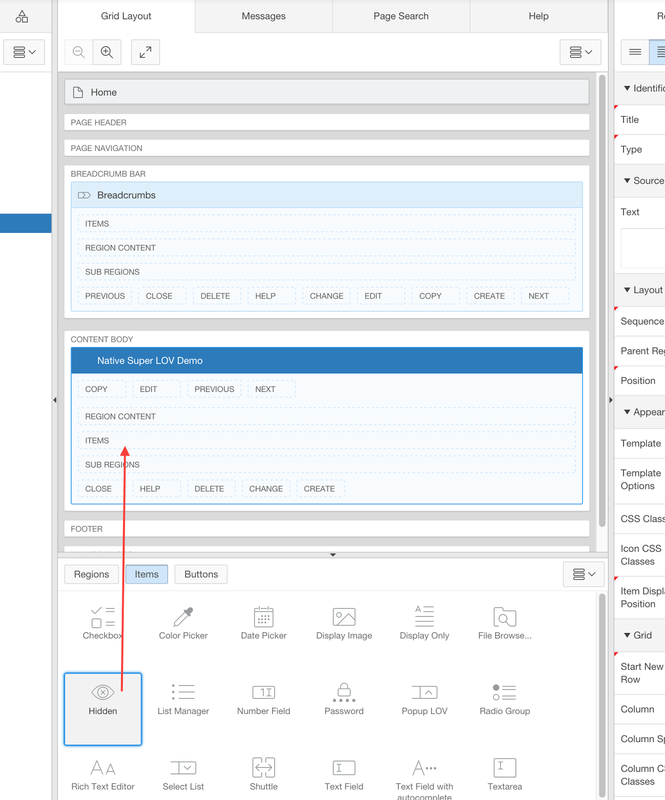 In the component panel on the left, click Page 2: Select Customer (top node in the tree) to access the page properties. Set Inline (under CSS) to the code below. 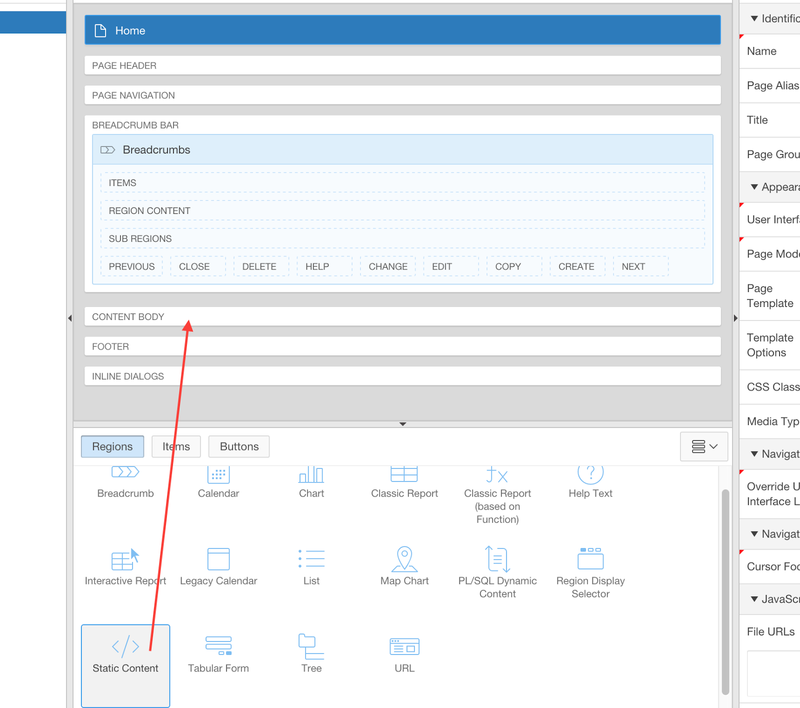 Drag and drop a Hidden item into the Select Customer region. In the component panel, click the new P2_NEW item to select it. In the properties panel, set Name to P2_ID. Drag and drop another Hidden item into the Select Customer region. In the component panel, click the new P2_NEW (may be named P2_NEW_1) item to select it. In the properties panel, set Name to P2_DISPLAY. In the component panel, open the Columns of the Select Customer region, and click CUSTOMER_ID to select it. In the properties panel, set HTML Expression to the code below. Set Static ID to customer_id. Set Hide (under Enable Users To) to No. Click Save in the upper right-hand corner to save your changes. Now we need to make it so that if a user clicks a row in the report two things happen. First, the hidden values from the row clicked must be proxied to the 2 new hidden items created in the last step. Once that's done we can just close the modal. If you're not already there, return to the Page Designer for page 2 and follow along. 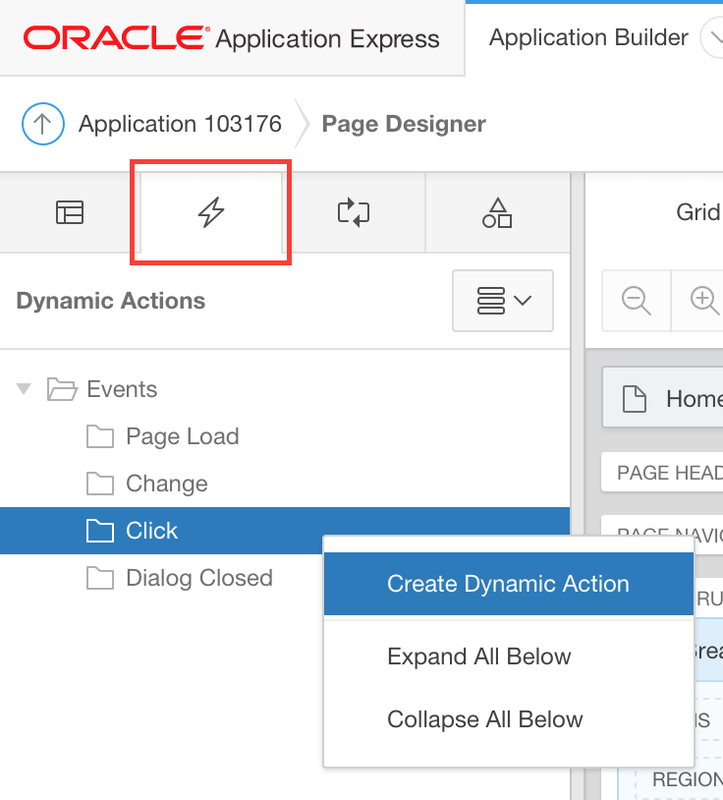 In the component panel, switch to the Dynamic Action tab. In the properties panel, set Name to Row clicked. Set Selection Type to jQuery Selector. Set jQuery Selector to the code below. This jQuery selector selects table rows in the Interactive Report. Set Event Scope to Dynamic. In the component panel, click the Show action under the True events. Set Selection Type to - Select -. Set Fire On Page Load to No. In the component panel, right-click True above the existing true action. In the properties panel, set Action to Close Dialog. Set Items to Return to P2_DISPLAY,P2_ID. At this point, if you click a row in the LOV, you should see the modal page close. We're getting close! In this last step we'll be creating a Dynamic Action on the home page that responds to the modal closing. We'll grab the values passed from the event and proxy them to our custom LOV items. Navigate to the Page Designer for page 1 and complete these steps. In the component panel, right-click the P1_CUSTOMER_DISPLAY item. In the properties panel, set Name to Dialog closed. Set Event to Dialog Closed. Now your handcrafted, super duper LOV item should be good to go. Enjoy! I can run the modal page with a normal button link, and selecting a row does close the page and return to the home page. Hi Skip back in 2016, so it's not surprising that it doesn't work anymore. Different versions of APEX often change the HTML emitted in different ways. If you create an example on apex.oracle.com that reproduces the issue and provide me with developer credentials (workspace/username/password), I'll take a look when I can. Feel free to email me (see links on right of blog) the credentials.